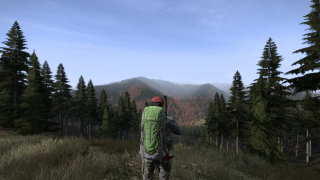 A new renderer has been top of DayZ players' wishlists almost since it entered Early Access in 2013. DayZ tends to chug on most hardware in any built-up area—the rendering is tied to the simulation, so more to simulate means spikier motion, regardless of graphics settings. For the first time, Lead Producer Brian Hicks has shown off what some were beginning to believe was a myth. It has a way to go before it reaches the public experimental build, but the DirectX 11 Enfusion Engine renderer is a noticeable improvement. Rain, everyone's favourite weather effect, is denser, bleaker and much more wet, falling in sheets instead of specks and, if you can believe it, no longer ignoring roofs. Watch until after the end of Hicks' preview and you'll see him picking off zombies that emerge from the deluge as grim, uncertain shapes. Recording brings the framerate down on both the DX9 renderer and the new Enfusion renderer of course, but we're told that the drop is considerably smaller with the new tech. Once the renderer goes live, we'll finally be able to use those GPUs we've got sitting around.